Use JSON files to save and import your MovieStudio and VideoStudio projects. Two additional features that enhance the way end users can work with RedcoolMedia. 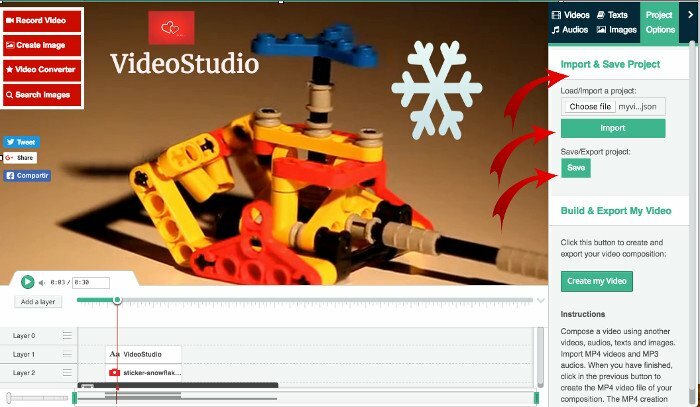 - VideoEstudio, the RedcoolMedia video editor online. - MovieStudio, the RedcoolMedia movie maker online. - Projects can be saved in a file for a later composition. - Project saved previously can be imported in either VideoEstudio or MovieStudio. The files used for importing and saving the projects are JSON files. You can work long hours, save your work, and continue working at any time because you have your work saved in a JSON file.